At Falcon Pine we boast a excellent history over the last five years of providing work experience opprtunities for students at most local schools in Calderdale. We work in partnership with the Kirklees and Calderdale Careers Service and can offer one or two week placements. We also have over several years operated a 1 day or 2 day work placement for students in their final year of school but who have expressed a desire to leave school at the end of year 11 and want to gain an early advantage in gaining experience. We often take on new staff via our work experience students and ar present have a 3rd year apprentice and a 1st year apprentice who have taken the work experience route. We also have a part time 1st year student that attends college and has continued his work experience with us as he seeks a permanent emplyment in another field. We recognise that offering work experience placements is vital to many students and gives them a good insight into the world of work well before they have to make big decisions about their future and we intend to carry on offering placements to students from all walks of life. If you have a son or daughter interested in this line of work then please feel obliged to contact us direct and we will answer any questions you may have & we will put you in touch with the careers services which oversee all work experience schemes. At Falcon Pine we have undergone stringent health & safety examinations as well as being fully insured in the form of employers liabilty insurance in the unlikely event of an accident. We have a folder in our showrooms with many thank you letters from work experience students and the feedback we get is very gratifying. Why buy new when we can protect the planet by reusing materials ? Our address is 3 North Bridge, Halifax, West Yorkshire, HX1 1XH.........But don`t assume we work just in Halifax as we carry out work in Huddersfield , Bradford , Leeds , Manchester , throughout Yorkshire and all over the UK. Remember we specialise in hand made to order fitted pine / oak kitchens, fitted pine wardrobes and reproduction / antique pine furniture as well as stocking hundreds of original internal and external victorian stripped pine antique doors and supplying / fitting reclaimed oak or pine flooring as well as spindle ballustrades.........basically if you want anything in pine, come down to Falcon Pine ! 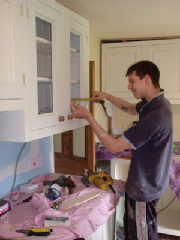 We have fitted pine kitchens in the following towns, if your home town is not listed then please do not worry as we are able to work in every part of the country for all our fitting work. We can easily find your house with our Satalliite Navigation system and when working far away we often arrange for overnight stays. Accrington Bacup Blackburn Blackpool Bolton Bootle Burnley Bury Carnforth Chorley Clitheroe Colne Darwen Fleetwood Formby Garstang Great Harwood Haslingden Heysham Hornby Kirkham Lancaster Leigh Liverpool Lytham St Annes Morecambe Newton-Le-Willows Oldham Ormskirk Pendle Poulton-Le-Fylde Prescot Rawtenstall Rochdale Salford Skelmersdale Southport St Helens Warton Widnes Wigan Winsford Manchester Stockport Trafford Tameside Macclesfield Rossendale Cheadle Gatley Barnsley Bawtry Dinnington Doncaster Hatfield Mexborough Penistone Rotherham Sheffield Wombwell Bedale Easingwold Filey Harrogate Knaresborough Malton Middleham Northallerton Pickering Richmond Ripon Scarborough Selby Settle Skipton Tadcaster Thirsk Whitby York Batley Bradford Brighouse Castleford Cleakheaton Dewsbury Halifax Hebden Bridge Holmfirth Huddersfield Ilkley Keighley Leeds Morley Normanton Ossett Otley Pontefract Pudsey Todmorden Wakefield Wetherby Yeadon . Pine kitchens, fitted wardrobes, reclaimed timber floors, furniture and original stripped pine Victorian doors are all available throughout the country. Although the areas listed above are places where we have worked we are able to work wherever you are placed in Great Britain. We also encourage customers to make use of text messaging as well, although Michael is always available on the above mobile number if you prefer to speak to him.